Chef Armand's cakes are famous for the delicious red cherries that adorn each one. 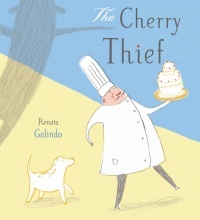 But when the cherries start disappearing, he sets a trap to catch the thief, with unexpected results! What will he do with the culprit, and is there a long-term solution that will make everyone happy? A charming debut picture book filled with very visual humour. Everyone has bad days, and children are no exception. When a black cloud descends on a little girl at school, support from a classmate with a great deal of imagination helps to brighten up everyone’s lives.